*Update - After going through some archives of our affiliates, the API (Asia Paranormal Investigators) and through our own research, we managed to find out more about the tomb and its background. Raymond Goh, one of the lead investigators and spiritual specialist of the API, elaborated on the existence of other tombs in the adjoining area which belonged to members from the Chua family. Therefore, this guardian stone would most likely have been a part of his possessions. The API later uncovered one of his wife's tombs as well. 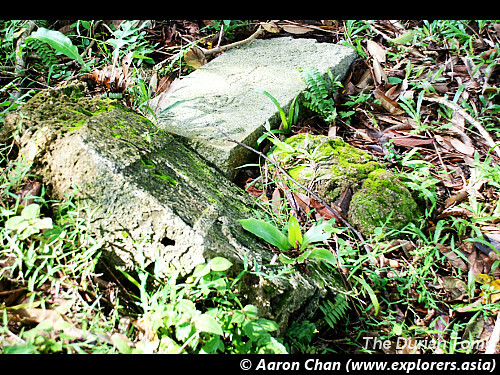 It turned out that our titular Durian Tomb might not be an actual tomb at all, but a guardian stone (more on this below) although we did find an empty space, a plausible void where a coffin was once lay to rest, below the headstone during our latest visit to the place. 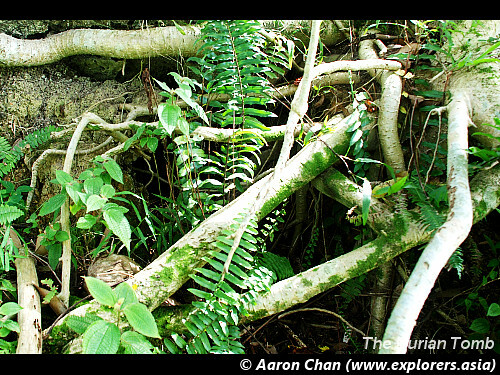 Back in 2005, the team embarked on a search for the "Durian Tomb" after first finding out about this tomb on a TV program on Channel 8. 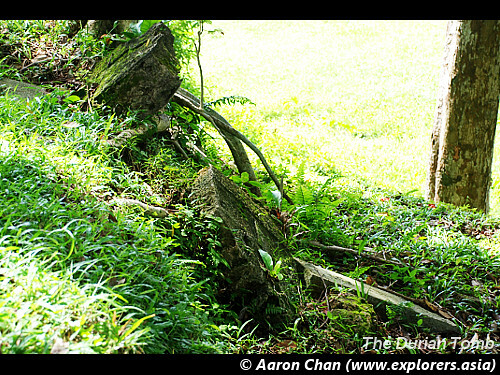 The tomb was alleged to be located near to a durian tree, hence the peculiar name, and was situated in the Thomson area within a private housing estate. 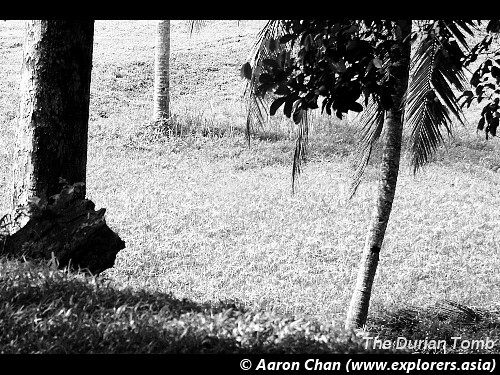 The durians which fell from this tree were said to be extremely delicious, although people who did not pay their respects before they picked up and savoured the durians, were purported to have experienced the most excruciating stomachaches thereafter. possible traces of offerings during our trip in 2005. 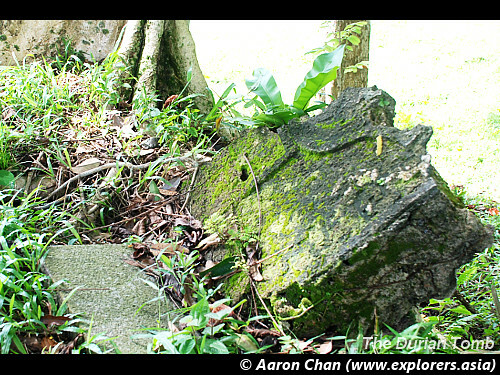 After a little research and asking around, we found this tomb lying at the end of Jalan Chempedak, a little known avenue which branched off from the busy Upper Thomson Road. It was during this trip that we found out that we had to do a little bashing to get to the tomb. 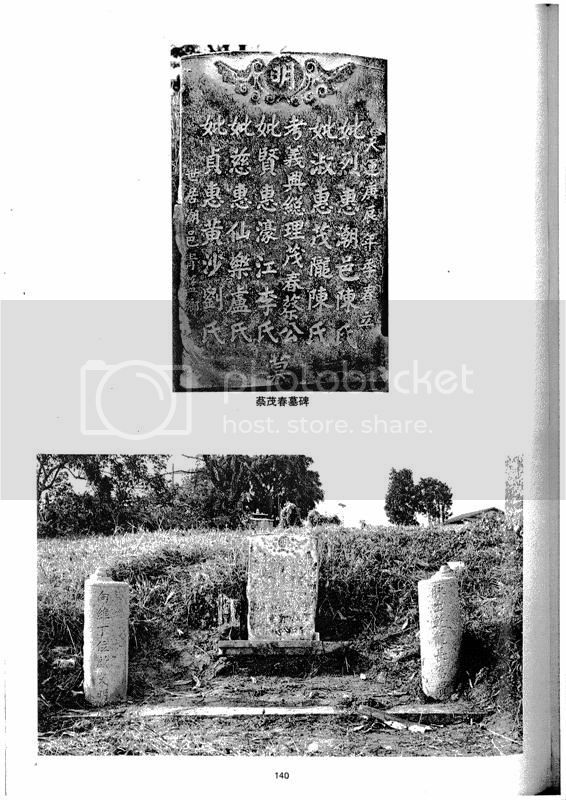 Upon studying the Chinese inscriptions on the tombstone, which bore the words "蔡宅 - 福神" (Literal Translation: Chua Household - Fortune or Guardian Spirit) we realized that the inscriptions on the headstone suggested that it might not an actual tomb, but rather a guardian stone which belonged to someone who bore the surname 蔡 (English: Cai | Hokkien: Chua). 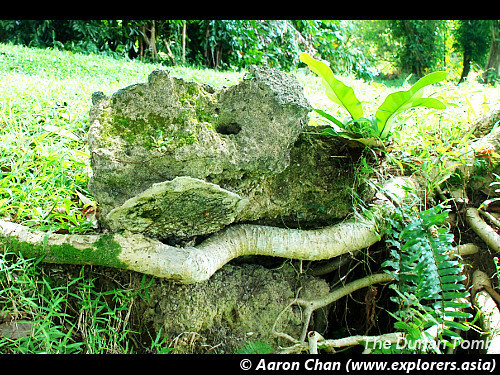 The Durian Tomb itself was shaded by a Jackfruit tree, instead of a durian tree as previously believed. In recent years, I noticed that the dense vegetation which had shielded the tomb antecedently from the main road had been cleared and the topography of the area had changed from lush greenery to a grassy meadow, speckled with the occasional tree. 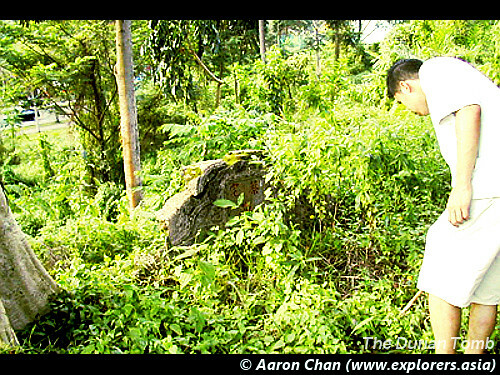 Curious on the plight of the Durian Tomb, I took it upon myself to unwrap the mystery of the tomb's predicament. Can you spot the forsaken tomb? As I walked down the pavement leading to the bus stop from Jalan Chempedak, I looked out for the Jackfruit tree to plot my marker before I stepped onto the grass. Although the area had been mostly cleared of undergrowth, the overgrown grass prevented me from forming a clear line of sight, camouflaging any possible potholes. I had to tread carefully while keeping to my azimuth. As I approached the tree, I could see that the former tombstone had been broken into pieces. Only the bottom half of the tombstone was visible, jutting out defiantly from the ground. Fragmented pieces of the tombstone lying below the drop-off beyond the tomb. Standing atop the promontory where the broken tomb was located, my greatest concern was confirmed. The tombstone had been smashed to bits. There was a hole leading to an empty void next to the bottom half of the tombstone, suggesting that the body below (if this was indeed a tomb) might have been exhumed. Curious and eager to find out if this was true, I made my way to an incline away from the broken tomb and went down to the same relief as the fallen pieces of the tomb I had seen previously. A photo of the grave, taken when I was going down-slope. The probable coffin was gone. In its place, an empty void. I discovered that there was an empty cavity below the tomb, surrounded by a mixture of tree roots, weeds and fresh dirt, as opposed to the conceived idea that a coffin that lay there beforehand. If this was an actual grave, the exhumed body would perhaps be transferred to a cemetery for a proper burial in newer surroundings. However, judging by the dilapidated condition of the tomb when we last visited, I doubt that there would be any living descendants who knew of the tomb's existence. The transfer of the body would have probably been a quiet affair, carried out by the relevant authorities. Other bits and pieces of the tomb lying close by. With the disinterment of the grave, yet another lesser-known body was transferred from its decrepict surroundings to a newer, albeit unfamiliar locale. 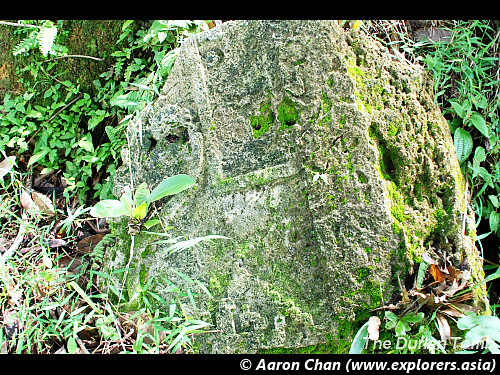 Thence, the Durian Tomb no longer exists, becoming yet another casualty of progress. I am not sure what that land parcel is being earmarked for, nor whether we'll see a new development in a few years' time, but I sure am glad that I have managed to preserve the memory of this unique tomb, a story that I'll be telling for years to come. 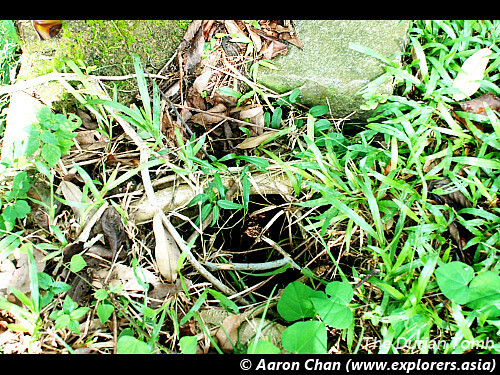 Raymond also shares an interesting discovery with us, the presence of a nearby tomb belonging to Mdm Tan - the second wife of Chua Moh Choon - who was exhumed mysteriously, leaving only the headstone. We will be popping by to document this peculiar tomb as well. Many thanks to Raymond for the tip-off. 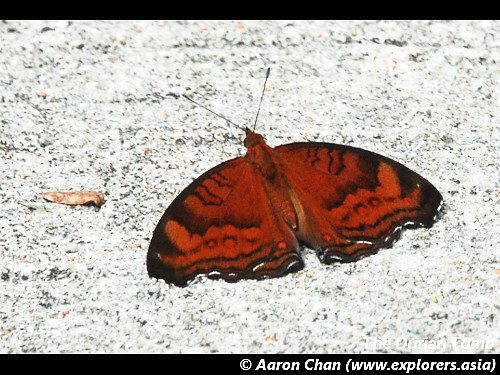 You can read about API's coverage on this mysterious tomb here. Do you know the person who was buried here? Was this a tomb, or a mere guardian stone? 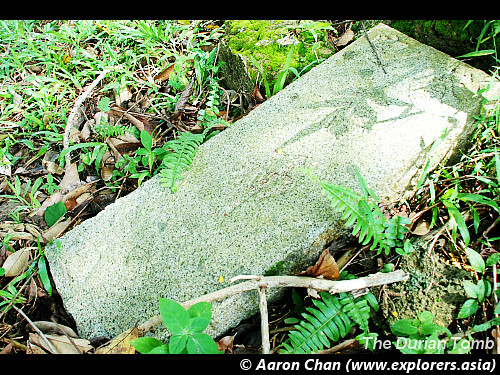 Perhaps you know of any stories surrounding the Durian Tomb? We'd like to hear from you!